(Dante: Paradiso, canto XIV lines 118, 119, 120). Once again, bravo Dante, always so up to date! The music played at concerts nowadays spans a variety of periods and styles in order to delight audiences, but it is a demanding task for performers to bring to life the different composers and musicians they interpret. Sometimes the concert programme seems very promising, but boredom can set in as the notes played all sound the same. To lighten the performer’s task, it might be useful to immerse oneself in the part by imagining oneself wearing the clothes and accessories that those musicians wore and playing as they played. How can this be done? By finding inspiration for success in the performer’s secret wardrobe. 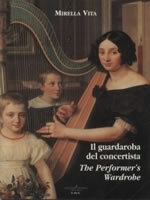 Mirella Vita has been an orchestral, chamber and recital harpist. She began her career playing many transcriptions, according to the customary usage of the time based on the firm conviction that the harp had no valid music of its own. When she realized that there was a huge repertoire of harp music spanning many centuries, she began to seek out original music for her syllabuses. She soon became aware that the extent of the treasure she was unearthing was too great for her own personal requirements, and so she began systematically collecting historical data, names and biographies of composers, as well as names and addresses of publishers and libraries. To make full use of her files it would be necessary to publish a work of many volumes; but it is much clearer and more accessible to divide the vast amount of material according to the various countries and their cultures. This volume traces the history of the harp in one of the most important musical countries in the world, and also details Dutch composers and their music written for the harp.